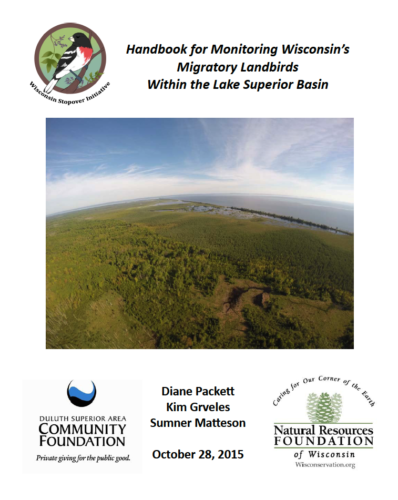 This Handbook—a dynamic document subject to modification as new information arises—provides a selection of protocols for monitoring migratory landbirds within the Lake Superior Basin of Wisconsin (Fig. 1. ), a shoreline area approximately 2,730 miles/4393 km (including islands) in size, across the counties of Douglas, Bayfield, Ashland, and Iron. The Lake Superior shoreline, like that of all the Great Lakes, is important stopover habitat for migratory birds (Ewert et al. 2006). The lake acts as an ecological barrier to migrants: the Wisconsin shoreline is the last potential stop before birds cross it northward in spring, and the first place for birds to make landfall after crossing southward in fall. The Apostle Islands provide refugia for migrating birds encountering bad weather as they cross the lake (Harris and Jaeger 1978). The coastal wetlands and estuaries provide emergent insects as food resources in spring (Smith et al. 1998) and the Bad River and Brule River corridors also attract concentrations of migrating birds during both seasons (Van Stappen and Doolittle 1993). One of the key steps to identifying and protecting these stopover habitats is monitoring the occurrence, distribution, and relative abundance of migratory birds. While populations of breeding and wintering birds have been monitored for many years through a variety of efforts such as the Breeding Bird Survey (BBS) and Christmas Bird Count (CBC), attention has only recently turned to the monitoring of birds during migration. There is still no standardized, nationwide monitoring effort, although regional efforts such as the Northeast Regional Migration Monitoring Network and the Midwest Landbird Migration Monitoring Network1 (MLMMN) have recently been formed. Monitoring during the migration period captures population data not adequately sampled by either the Breeding Bird Survey or the Christmas Bird Count (Rich et al. 2004), and is important as attention is now shifting to provide for the full life-cycle needs of birds. Land protection organizations, including The Nature Conservancy, West Wisconsin Land Trust, and the Bayfield Regional Conservancy. These organizations may survey potential acquisition parcels to determine those that have the greatest value for migratory birds. Conservation organizations, such as the Wisconsin Stopover Initiative, Wisconsin Bird Conservation Initiative, and the Western Great Lakes Bird and Bat Observatory. These groups may conduct migratory bird surveys as part of a broader state or regional conservation strategy. State, Tribal, and Federal agencies, including the US Fish & Wildlife Service, Wisconsin Department of Natural Resources, the National Park Service, the USDA Forest Service, the Lake Superior National Estuarine Research Reserve, the Red Cliff Band of Lake Superior Chippewa Tribe, and the Bad River Band of the Lake Superior Chippewa Tribe. These governmental entities may conduct migratory bird surveys as part of a broader state or regional conservation and/or management plan. Academic institutions, such as University of Wisconsin, University of Minnesota, University of Michigan, and the Sigurd Olson Institute of Northland College. Academics may find this this protocol useful as part of teaching field methods for ornithology, or for academic research on topics related to bird migration.